(Phys.org)—Animals have developed a variety of strategies for dealing with increasing noise pollution in their habitats. It is known, for example, that many urban birds sing at a high pitch to differentiate their song from the low-frequency sound of road traffic. However, as scientists from the Max Planck Institute for Ornithology discovered, this is just a useful side effect. The real reason for this behaviour is that songs at a higher pitch are also automatically louder. The birds can make themselves heard far better in city noise by increasing the volume of their song than by raising its frequency. Despite the numerous unfavourable environmental conditions they encounter there, many wild animals have colonised cities as a new habitat. In cities they must deal with greater numbers of humans and with more light and noise pollution than they encounter in rural settings. However, the urban habitat also offers certain advantages, for example a more abundant supply of food and new breeding options. Many animals have thus adapted surprisingly well to city life. To attract mating partners and defend their territories, urban robins sing in the latter night when the traffic noise decreases after the evening rush. 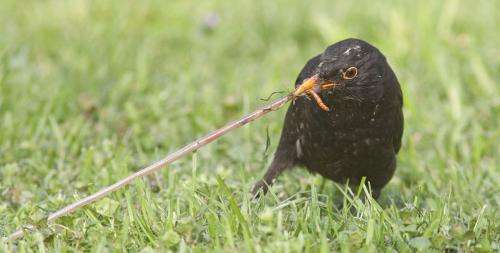 Many other bird species, including blackbirds, sing in urban environments at a higher pitch. So their song is easier to detect in the lower-frequency traffic noise. However, as a group of scientists from the Max Planck Institute for Ornithology in Seewiesen and Radolfzell has discovered, this is just half the truth. They studied urban blackbirds in the city of Vienna and country blackbirds in the nearby Vienna Woods. Additionally, they raised birds by hand at the Max Planck Institute and investigated the correlations between the frequency and amplitude of their song under controlled conditions. It emerged from this research that the animals were able to produce higher tones at higher amplitudes. In the city, blackbirds sing preferably at these high frequencies that they can produce particularly loudly. In a further step, the researchers examined which effect is better suited to avoiding the acoustic masking by traffic noise: the higher frequency or the higher amplitude that results from it. "The higher volume of the higher-pitched song is more effective than the higher frequency," says Erwin Nemeth, first author of the study. "So we assume that the increased volume is the main cause of the higher frequency singing by city birds." Henrik Brumm, the leader of the research team, adds: "By actively selecting high-frequency sounds, the city birds can increase their capacity to sing loudly and in this way counteract the acoustic masking of their song by the ambient noise."